To create Jack-O-Peppers: Slice the top off of each pepper, reserve. Remove the seeds. 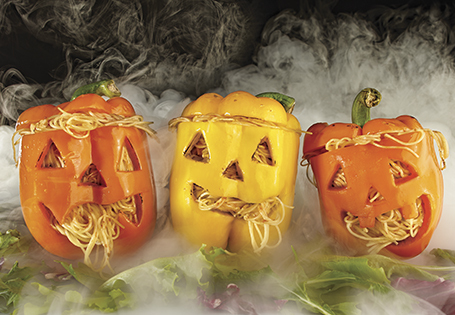 Use a sharp knife to cut faces into each pepper to create a Jack-O-Lantern face. Coat the peppers and tops with cooking spray. Season with salt and pepper, to taste. Place the peppers in the prepared baking pan. Bake for 15 minutes. Reserve. For the tomatoes: Fill a large saucepan with water, bring to a boil. Slit the bottom of each tomato with an X. Place tomatoes into simmering water for 1 minute until the skin begins to peel. Remove the tomatoes and run under cold water to remove the skin. Cut the tomatoes in half around the center/equator. Remove the seeds, dice the tomatoes. Reserve. In a large skillet, heat the oil over medium-high heat. Add the garlic and onions. Sauté for 3 minutes or until fragrant. Add the tomatoes, basil, oregano and rosemary. Sauté for 5 minutes. Season with 1/2 teaspoon salt and 1/8 teaspoon pepper. Add the cooked pasta, toss until well coated. Season with salt and pepper, to taste. Fill each pepper with pasta. Place the peppers on a bed of spring mix.